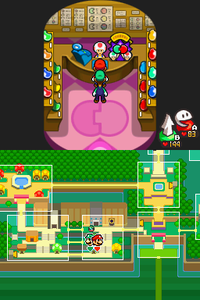 The Badge Shop is one of three equipment shops in the Nintendo DS game, Mario & Luigi: Bowser's Inside Story. It is located in Toad Town, along with the Gear Shop and the Item Shop. It is also the only shop that sells badges in the Toad Town Mall. The shop's logo is two badges, and the exterior of the shop has a blue shop roof. Inside the shop, a Toad can be seen standing behind a counter. On the counter, there is a cash register and sign with two Toads putting badges together. On the left and the right of the shop, there is a rack of many colorful badges. Powerful Badge 2000 coins Increases attack power. Bonus Badge 500 coins Gives extra bonus coins. Bro Badge 1000 coins Restores SP. Great Badge 500 coins Restores HP if the player receives a Great or Excellent in a battle. Excellent! Badge 1000 coins Restores HP if the player receives an Excellent in a battle. This page was last edited on February 25, 2018, at 16:35.